Red-eyed vireos nest in my yard every year. They are wonderful birds and welcome guests, but this year a different vireo seemed to be settling in the yard. I had heard it singing for a week, longer than migrants stick around, but I still did not tell anyone for fear of jinxing it. I thought a blue-headed vireo might be taking up residence! Both species are common in the eastern U.S., but red-eyed vireos are more widely distributed. Blue-headed vireos prefer higher elevations and deeper forests. When I first came to the South, it was to study neotropical migrants in Nantahala National Forest, and blue-headed vireos were abundant in that rare place. Aside from reminding me of a special time and place, they are charming in their own right. They used to be called solitary vireos, a terrible misnomer since they almost always occur in pairs, chattering at each other like an old married couple. The only reason I can imagine for their former name is the melancholy tone of their song. That same endearing expressiveness comes through in all their vocalizations. Also, they look like they are wearing spectacles. 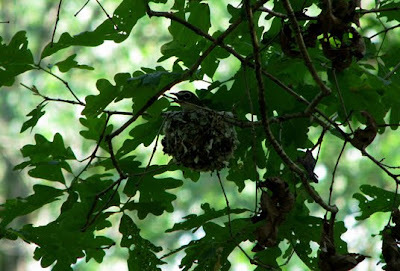 Today I saw their nest just a few yards from my front porch in the lowest limb of a white oak.